XII, 418 p., 12,2 x 19,4 cm. With contributions by Damir Barbaric, Walter E. Ehrhardt, István M. Fehér, Jean Grondin, Agnes Heller, Jörg Jantzen, Ernö Kulcsár-Szabó, Reinhard Mehring, Rainer Nicolaysen, Béla Pokol, Walter Rüegg, Tamás Tóth, Mihály Vajda, Wilhelm Vossenkuhl, Paul Ziche and Günter Zöller. 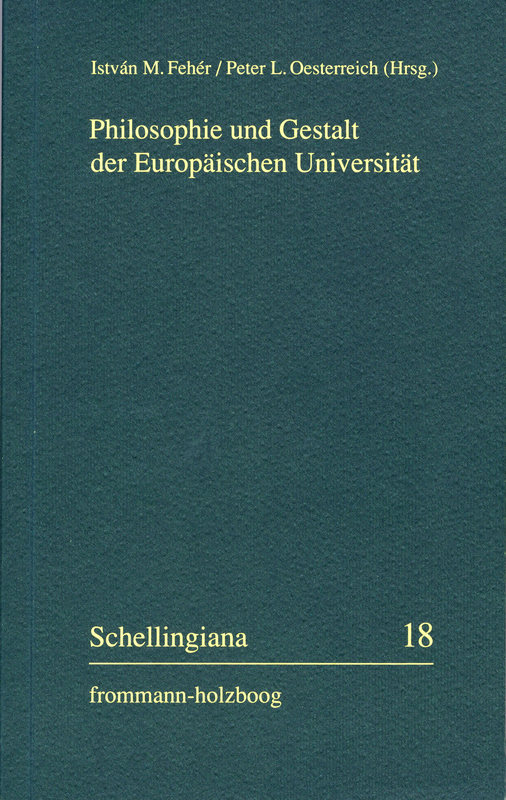 Based on Schelling’s ›Vorlesungen über die Methode des akademischen Studium‹ (Lectures on the Method of Academic Study), this volume reveals a broad spectrum of reflections on the relationship between philosophy and the ›Gestalt der Europäischen Universität‹ (Shape of the European University). The subjects dealt with range from lectures from the perspective of the history of ideas on the origins and self-image of the institutions of »university« and »sciences and humanities« to an exploration of the pertinent discussion in German idealism with a focus on Schelling’s lectures and finally to studies of the current shapes of universities in five case studies using international examples.